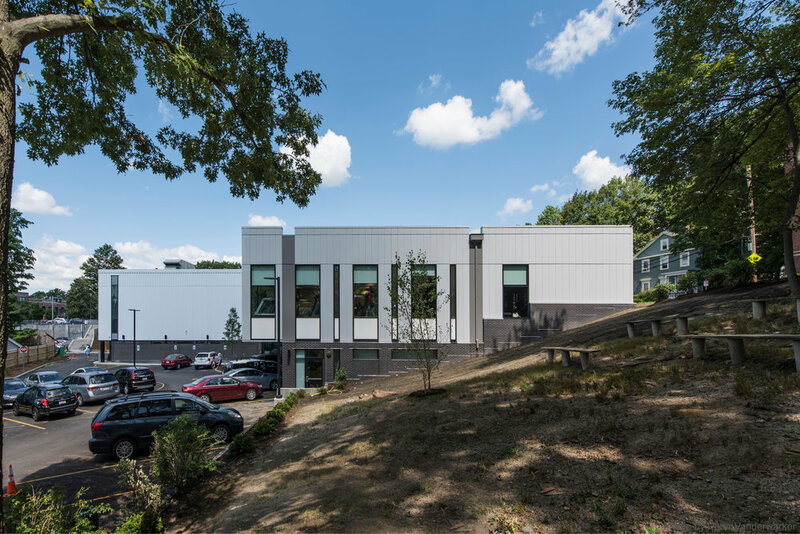 West Roxbury YMCA — Linea 5, Inc. 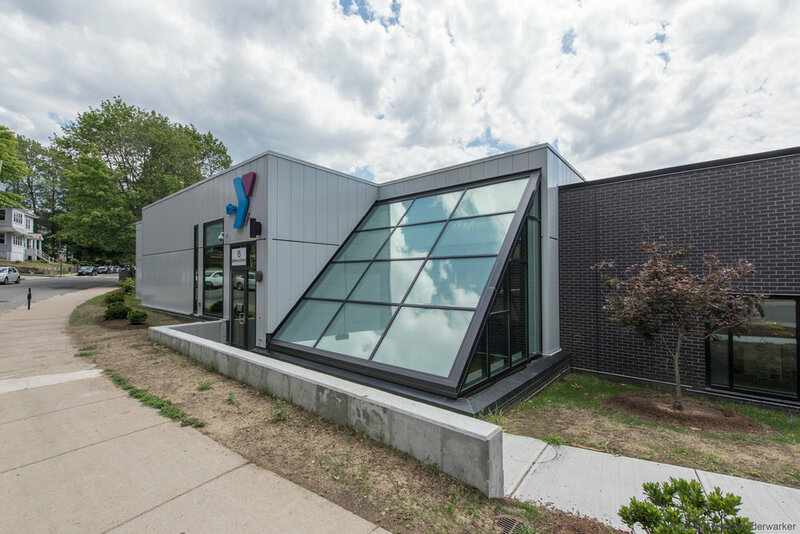 The Parkway Community YMCA is committed to promoting healthy living, youth development, and social responsibility in the West Roxbury and Roslindale communities. The newly expanded facility consists of a new 15,000 SF Wellness Center, a new 8,000 SF Aquatic Center, and a renovated Gymnasium wing. 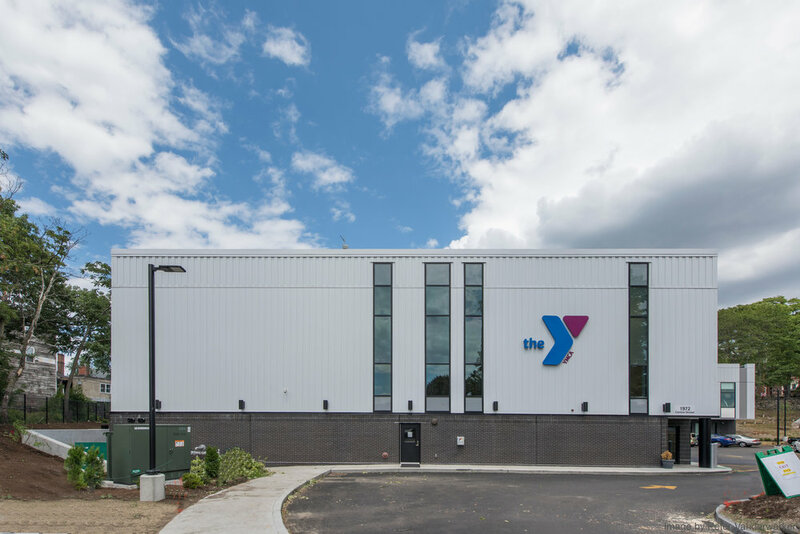 The YMCA has been an important part of the neighborhood for over 60 years, offering a Gym, Pool and multipurpose space, but the existing facility was incapable of meeting the modern needs of the children and families the YMCA serves. In order to accommodate existing members to the greatest extent possible, construction was phased to allow for continuous operation. The existing Gym was completely renovated and reclad, after which the remainder of the existing facility was demolished to allow for construction of the new Wellness and Aquatics wings. Many of the surrounding buildings are brick, and new brick masonry with contemporary color and texture was chosen for ground-level cladding, with insulated metal panels above. Because the lot slopes down significantly from a residential street towards a public park and playground, the facility is built into the hillside, with a single story facing adjacent housing and sloped glazing to bring light to the spaces below. A double-height entry at the intersection of Gym, Aquatics and Wellness wings faces the park. The refreshed Gym features new floor-to-ceiling windows, providing natural light for basketball and volleyball players. Below the Gymnasium, new locker areas provide changing areas for members of all ages and genders. The new Aquatic Center includes a new pool with separate lap and children’s play areas, as well as a new Steam Room and Sauna. The Wellness wing includes plenty of bright and modern exercise space, with views to the Lobby, Pool, and park outside. Dedicated childcare and teen areas better accommodate existing programs and provide space for new initiatives. A variety of new studios, including a dedicated spinning studio, allow the YMCA to hold multiple group fitness classes and adapt to evolving membership needs and fitness trends. 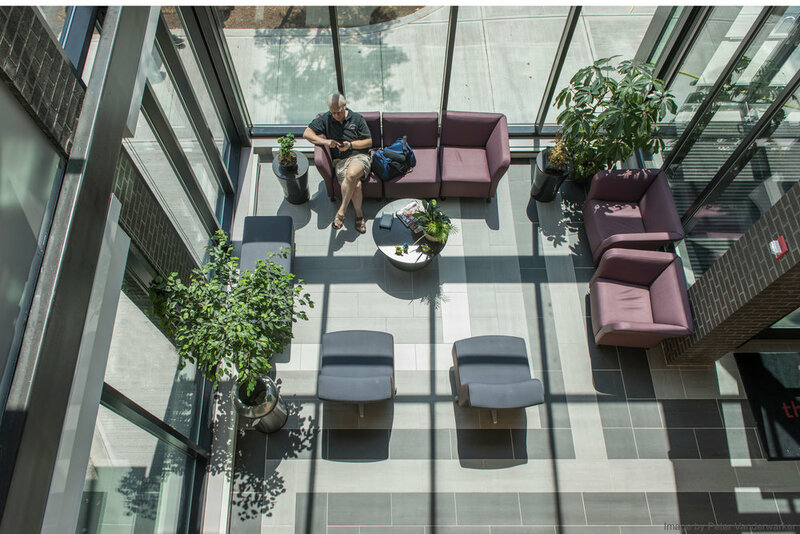 Inside the entry, the double-height Lobby features abundant natural light and includes spaces for members to relax and socialize. 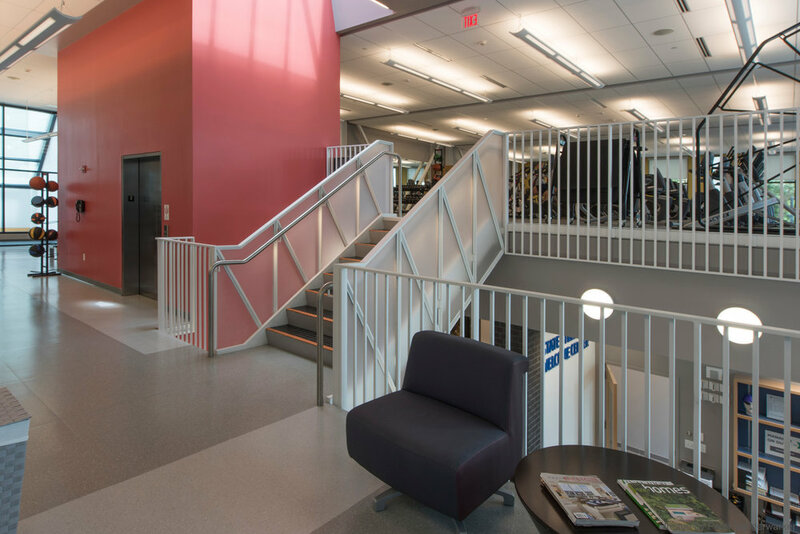 As the core of the facility, the Lobby connects public recreation areas to all three levels of new construction, highlighting relationships between different YMCA program areas and easing wayfinding for all users.